Your Visiting Nurse Association of Ohio nurse will educate you and your family about your disease, treatments and necessary lifestyle changes. The rest of your care team -- clinicians, therapists and other professionals -- will help you learn how to prevent complications and recover if complications do occur. And, if you need assistance with household tasks and personal care, homecare aides can support and assist where needed. Michelle Kerr, RN, chief clinical officer for VNA of Ohio, said patients diagnosed with certain chronic diseases, especially diabetes, Congestive Heart Failure (CHF) or Chronic Obstructive Pulmonary Disease (COPD), need close attention from a Registered Nurse. 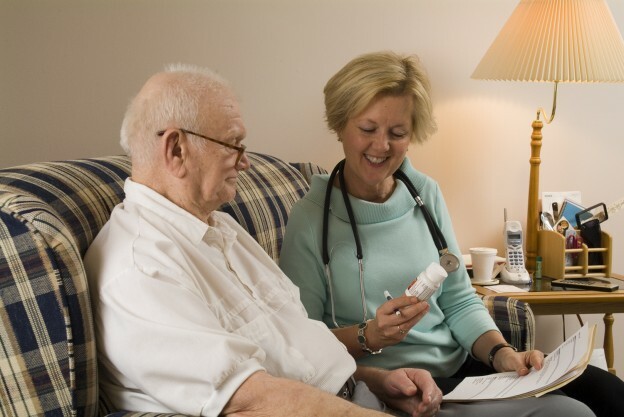 In most cases, a visit from an RN will include an assessment and plenty of conversation. For example, newly diagnosed diabetics who are older and live alone are especially in need of in-home help as they learn what it feels like to have low or high blood sugar. Without that knowledge, they may be alone when the warning signs occur and uncertain if they should call for help. VNA of Ohio's telehealth (sometimes called telemedicine) monitoring program can be very effective for chronic disease management. Nurses can monitor a patient's vital signs remotely between in-person visits. If readings are not what they should be, the patient and his or her doctor will be alerted. Patients with chronic diseases that progressively debilitate often return to VNA of Ohio for help during the later stages of their diseases. Homecare aides can help with everyday tasks, from self-care and grooming to medication reminders and meal preparation. VNA of Ohio team includes a social worker to help identify options for long-term care in the home or elsewhere. Learn more about VNA of Ohio TeleHealth services, or call us today at 1-877-698-6264.